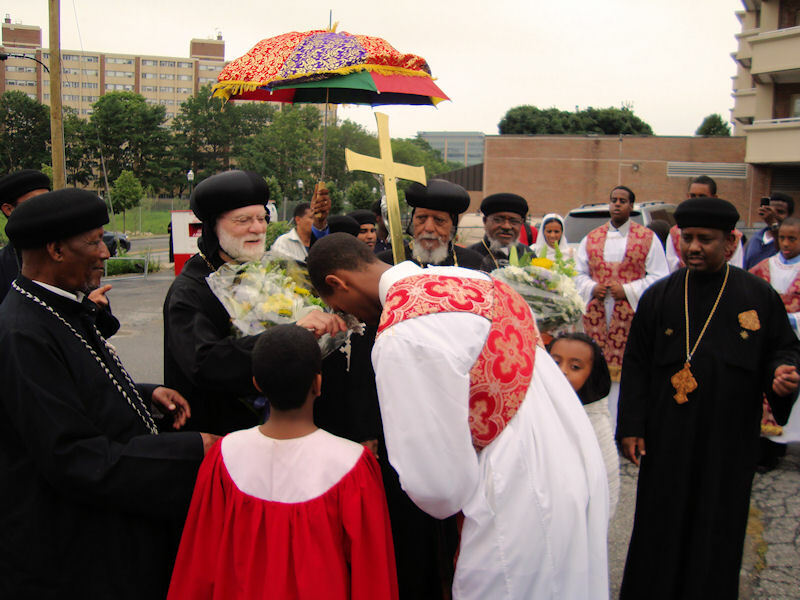 At the invitation of the North American Archdiocese of the Eritrean Orthodox Church Abba Seraphim attended its twelfth annual conference, held this year in Stamford, Connecticut. 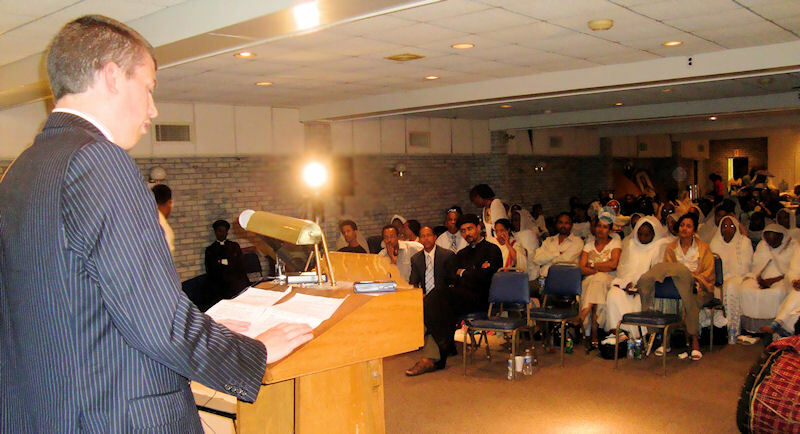 Accompanied by Mr. Trevor Maskery, he was received at the Hampton Inn on Friday, 23 July by His Grace Bishop Makarios and introduced to the clergy and senior lay representatives of parishes as far afield as Oakland (California), Atlanta (Georgia), Seattle (Washington) and Toronto as well as east coast communities. From here the clergy processed the short distance to the hall of the Sacred Heart Parish in Schuyler Avenue, which was made available for conference sessions by the Roman Catholic Diocese of Bridgeport. Upon arrival the clergy were greeted by a large body of laity and vested deacons who conducted them to the hall with traditional songs and the beating of drums. 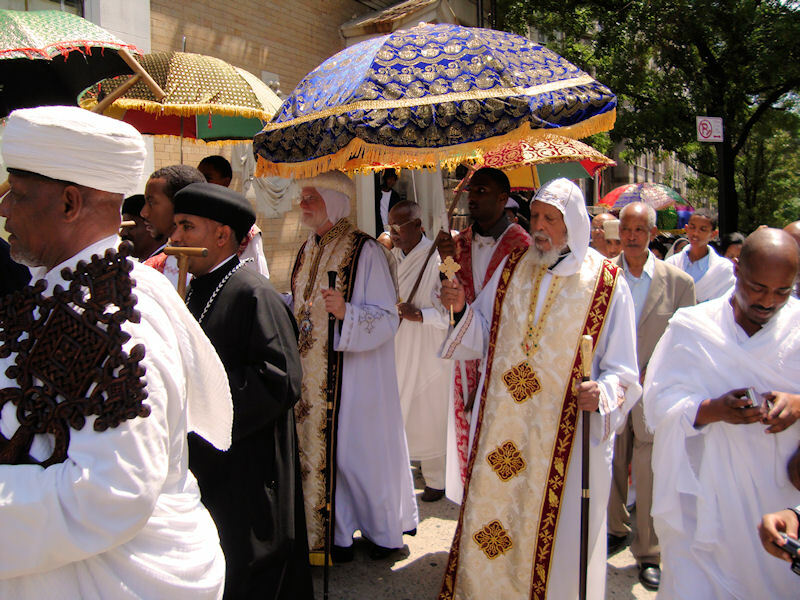 They were then formally welcomed by Bishop Makarios, following which Abba Seraphim spoke of his close association with the Eritrean Church since its independence and his delight at visiting the North American diocese, which had remained such a staunch supporter of His Holiness Abune Antonios. 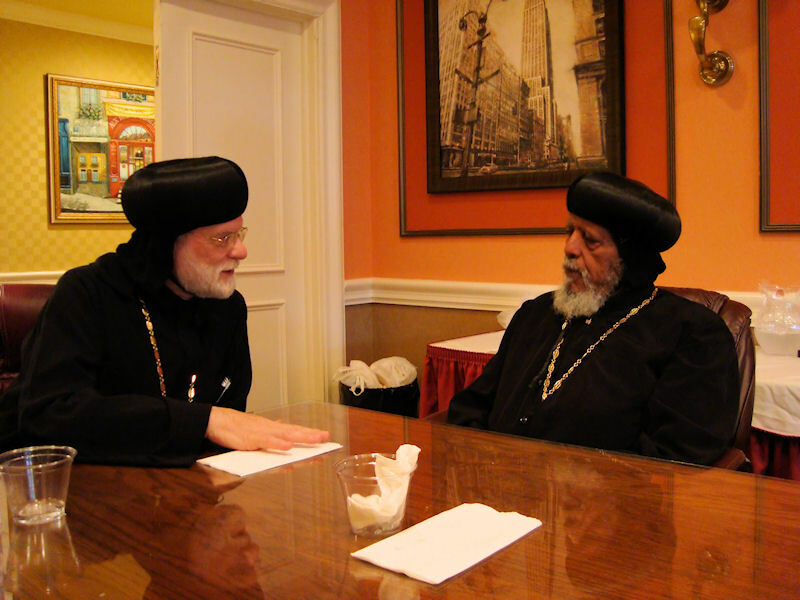 Later that evening Abba Seraphim and Bishop Makarios dined together and were able to discuss matters of common concern and interest. 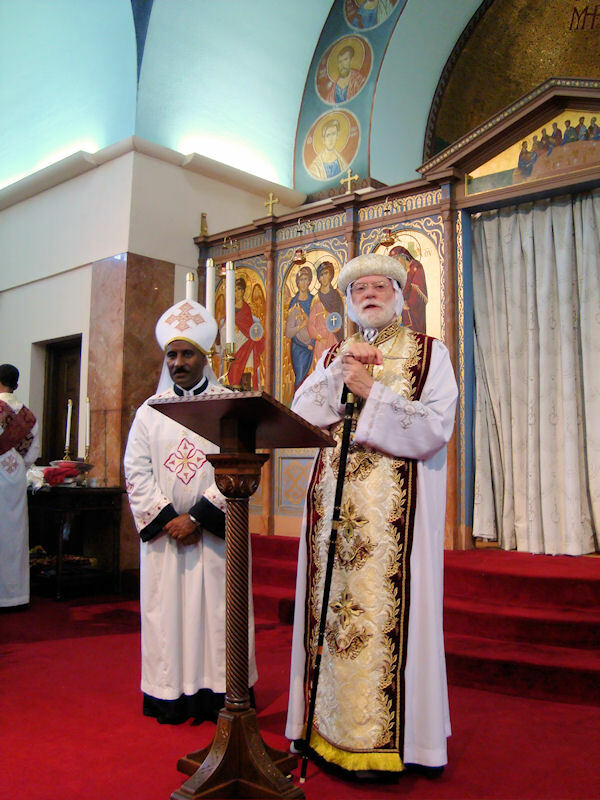 On Saturday morning, 24 July, Abba Seraphim and Bishop Makarios, assisted by the priests and deacons, celebrated the Divine Liturgy (Anaphora of the Apostles) at Archangels Greek Orthodox Church in Bedford Street, Stamford, during which Professor Deacon Habtu Ghebre-Ab was ordained a priest (with the name Father Athanasios) to serve the Eritrean community in Cincinatti. The new priest had only visited Abba Seraphim at the Church Secretariat in Charlton two months previously when he had spoken of his planned ordination although at that time Abba Seraphim had not planned to be in New York this summer. 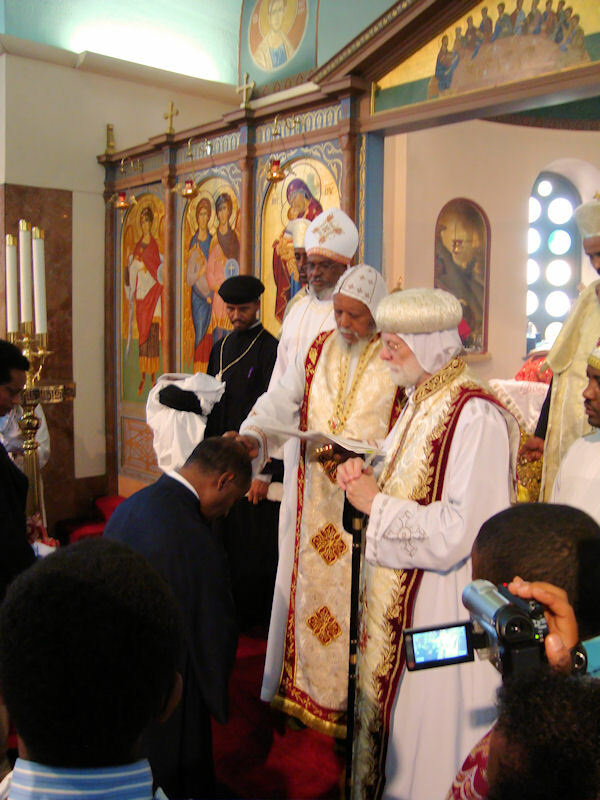 During the Liturgy Abba Seraphim preached on the Gospel (John X: 11-21) and illustrated the importance to the apostolic faith and traditions, which recognised Abune Antonios as the canonical Eritrean Patriarch or the one who “entereth in by the door” as “the shepherd of the sheep” in contrast to the government appointee who “enterest not by the door into the sheepfold, but climbeth up some other way, the same is a thief and a robber.” Abba Seraphim declared that the clergy and faithful who upheld the canonical church order were faithful to the apostolic tradition and were right not to follow a stranger but rather to “flee from him: for they know not the voice of strangers.” During the service special prayers were said for Abune Antonios and those imprisoned in Eritrea for their faith and the Patriarch’s picture was prominantly displayed in the church. After lunch Mr. Trevor Maskery, who has designed the websites for Patriarch Antonios and the British Orthodox Church, spoke about the importance of harnessing the power of the internet and directed attention to some of the opportunities which still needed to be grasped. 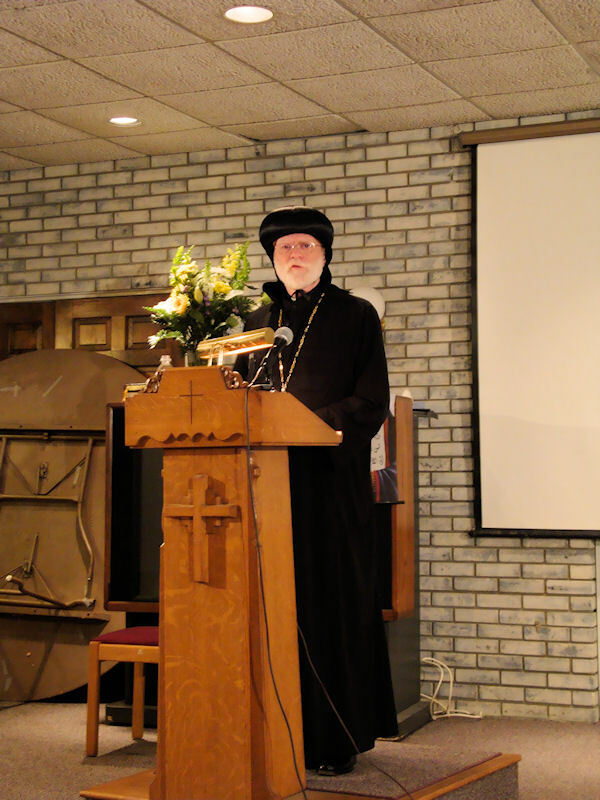 Abba Seraphim also gave a keynote address, “How shall we sing the Lord’s Song in a strange Land?” addressing some of the issues which face an expatriate community which has largely fled from persecution at home. The text of this talk is now available in booklet form from www.lulu.org In the evening Abba Seraphim and Mr. Maskery dined with a group of lay leaders and explored further some of the issues raised during the day’s meeting. On Sunday. 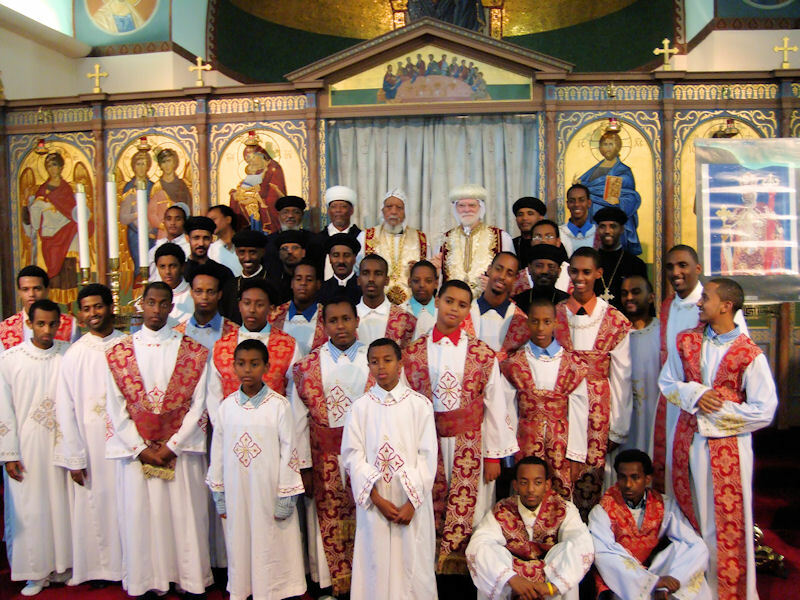 25 July Abba Seraphim and Bishop Makarios, assisted by the priests and deacons, celebrated the Divine Liturgy (Anaphora of St. Jacob of Serough) with St. Gabriel Eritrean Orthodox Parish of New York which worships in the basement chapel of Our Lady of Lourdes Catholic Church at 469 W. 142nd Street, New York, which was also the commemoration of the Archangel Gabriel. 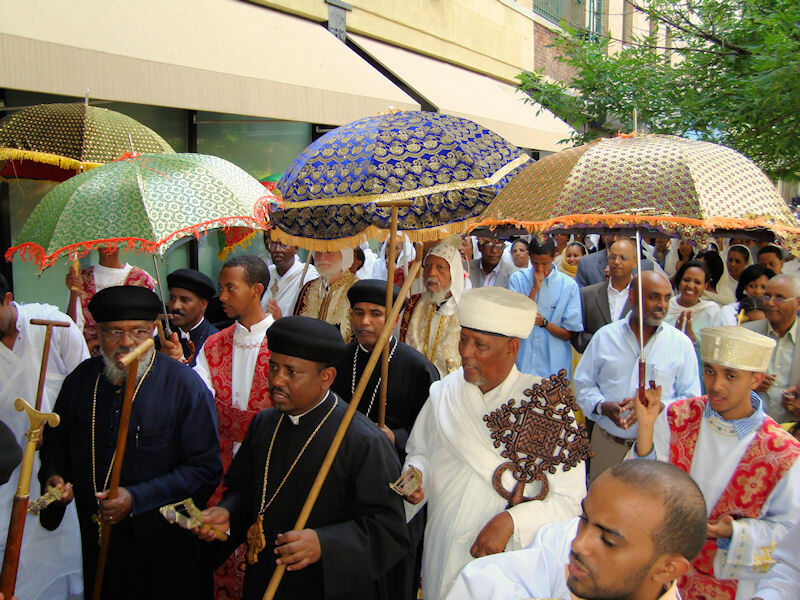 After the liturgy the clergy and people went in solemn procession around the entire block as an important witness in the community where they worship. Many people came out to watch with deep respect and to share in the joy which the procession presented to all around. After a festive agape Abba Seraphim again preached on St. Gabriel and the angelic ministries and Bishop Makarios made commemorative presentations to Fr. Athanasios and those also ordained hegoumenos and reader over this blessed weekend. Abba Seraphim returned to London on 26 July.